To get an accurate measurement of club length. Measure the club at the angle that the bottom of the clubhead lies in its playing position on the floor. Measure from the floor to the end of the Grip. Before we use the chart below, it is important to know your height and your wrist-to-floor measurement. To determine your wrist-to-floor measurement wear normal shoes and stand on a hard surface with your arms hanging relaxed at your sides. Then have someone measure from the point where your hand meets your wrist (your “wrist crease”) to the floor. With this measurement and your height, we will be able to determine the correct club length for you. 35.5″ +0.25″ +0.25″ +0.25″ +0.25″ +0.25″ +0.25″ Std. Std. Std. 35″ +0.25″ +0.25″ +0.25″ Std. Std. Std. Std. Std. Std. Club Length – One of the most important aspects of introducing a young player to the game of golf is providing them with proper fitting equipment. Poor fitting clubs can lead to swing problems that can be difficult to correct in later years, and even affect the desire to play. Clubs that are too long will cause the junior to compensate with a swing that is too “flat”, and clubs that are too short will lead to a swing that is too upright. Both instances will make it difficult for the junior to make consistent contact with the ball, resulting in needless frustration and an understandable desire to give up and try something that is more fun! The best choice is a club approximately 1.5” longer than an exact fit, which allows the junior to “choke down” during initial play, gradually moving his/her hands higher on the grip as they grow over the next two seasons. You can find the pre-packaged set that matches best by comparing your junior’s measurements with those recommended by the manufacturer. Typically, if the height range for the set is 44 – 52 inches and your junior stands 48 inches tall you would have a great match. If your junior is at the lower end of the scale you may want to continue your search, as the clubs may be be too long. If your junior is at the high end of the range you may want to select the next larger size, or search for a different height range. Bottom line: if your child’s height is about in the middle of the manufacturer’s suggested height range, you’re safe. If not, search for a different height range or consider custom built clubs, which we build about 1.5 – 2″ longer than an exact fit. This allows the junior to grow into the clubs over the next two years and allows parents to maximize their investment. Club and Shaft Weight – Another important aspect of junior golf clubs is the overall club weight. Heavy clubs with cut down adult steel shafts and clubheads designed and weighted for adults are very difficult for smaller golfers to swing efficiently, and sometimes result in the junior golfer spinning around way too many times at the end of the swing! A club properly weighted for a junior will allow the speed of the arms to match the rotation of the body, resulting in better club head-ball contact, more distance and improved accuracy. We have found that up to about nine years old a junior needs both a lighter club head and a lighter shaft. A lighter shaft combined with standard weight clubheads works great for most nine to twelve year olds, preparing them for graduation to adult clubs in their teen years. We look far and wide for the perfect match between quality, technology and playability, then test the clubs extensively to make sure our customers will be happy with the performance characteristics. Shaft Flex – It is very difficult to design a junior shaft that matches the varying swing speeds of juniors. Companies have marketed junior clubs with shafts that were proven to be too flexible, and at the other end of the spectrum Tiger Woods successfully played an extra stiff adult shaft as a kid. Since a shaft which is too flexible does not work well and most junior golfers do not possess the athletic ability of Tiger Woods, something in the middle suits most juniors. In general, the younger the golfer the more flex required, so we look for specially designed composite shafts in sets for juniors between three and eight years old. For juniors between nine and twelve years old we offer shafts specially designed for juniors (smaller grip diameter, added flex) . We also offer a lightweight, low flex point graphite shaft for those juniors with slower swing speeds or those seeking added distance. Grips – Since the grip is where the human body contacts the club, we believe it should be as comfortable as possible, so we use the best grips available. 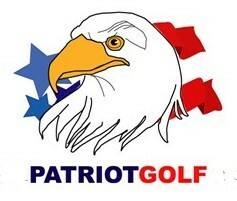 Disclaimer: Patriot Golf only sells legal golf equipment as represented by our golf distributors, suppliers, and manufacturers. Golf Club performance is based solely on its own merits and quality. These clubs may bear some resemblance to one or more pro-line clubs, however, these clubs are not advertised, represented, or sold to be clones, copies, or imitations of any club other than the original manufacturer’s. If a club head is found to infringe upon a patented design, please notify us and it will be removed immediately.